Read nextWill large-scale 3D printing revolutionise automobile manufacturing? Volvo is serious about you being productive in traffic. So serious that it’s released a new concept aimed specifically at working commuters. According to the Swedish car maker, Concept 26 (named to reflect the average daily commute to work of 26 minutes) is meant to take the frustration out of your daily commute. Mostly though, it’s about choice. If you’re in a massive tailback and you need to take care of a few emails, the car can take care of things for you. And if you’re tearing down a scenic mountain pass then you can resume control. When the driver wishes to delegate driving to the car the steering wheel retracts, the seat reclines and a large display emerges from the dashboard, allowing you to work or catch up on Netflix. If nothing else, the concept suggest that the future of motoring will look a lot more like your lounge. 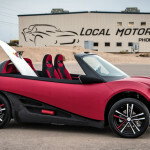 Will large-scale 3D printing revolutionise automobile manufacturing?